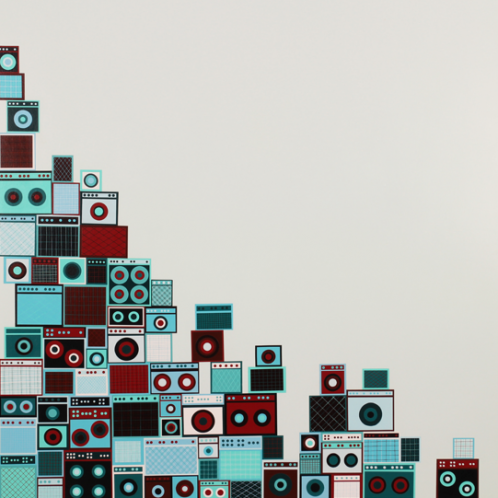 Jonathan LeVine Gallery currently presents Search Party, a series of eight new works and a site-specific installation by Philadelphia-based artist Jim Houser. Through Houser’s signature style of visual poetry and personal iconography, the artist extends his practice of self-examination to include the topic of art making itself. Works in this exhibition serve to consider Houser’s relationship to the artwork he creates, the compulsion to create it and how his lifestyle has been formed, consequently. Houser’s collages become visual poems through which he cathartically communicates his most private thoughts and emotions with surprising candor. By cataloging his experiences and feelings through a unique pictorial language, the artist creates his own brand of curative iconography. 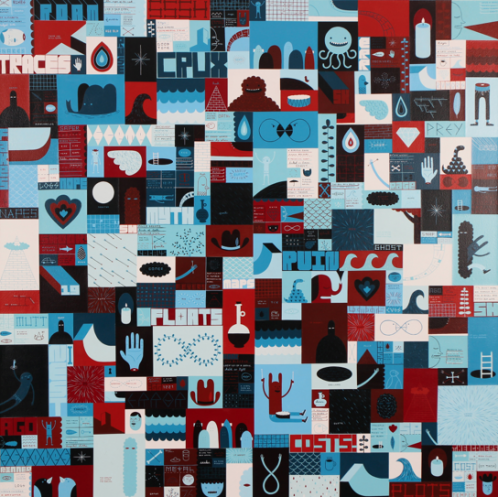 Houser’s aesthetic often mixes stylized figures, hand-drawn typography and geometric shapes, creating quilt-like collages in a cohesive color palette.